Beef stew is one of those dishes I really enjoy making on chilly days. 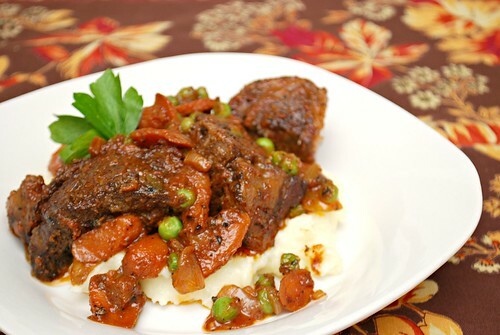 The slow braising on the stovetop makes for amazing aromas that waft through the house. This was especially easy to make because it involved only browning the beef, throwing in some aromatics and letting time to it's magic over a low flame. As much as we enjoyed the crockpot version, I tried it out in our Instant Pot with great results! 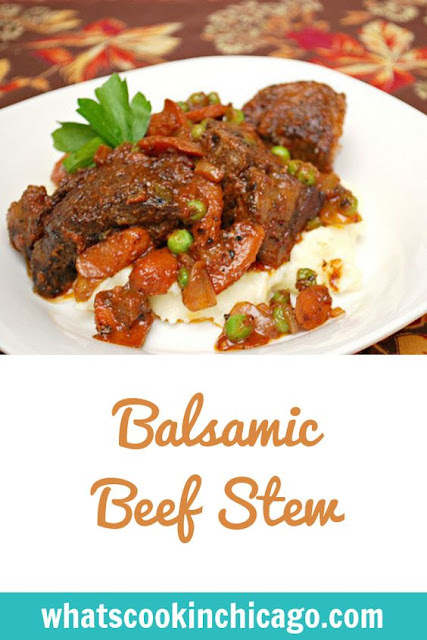 We loved this over creamy mashed potatoes and leftovers were great over rice! If you don't have an Instant Pot, you can get the slow cooker/crockpot recipe version here! Season the beef with salt and pepper and dregde in flour to coat. Shake off any excess. Press SAUTE and add the oil into the IP. When hot, add the seasoned & coated beef in batches to the IP in a single layer and brown on all sides. Remove browned beef from IP and transfer to a plate; set aside. Repeat with remaining beef. After all the beef has been browned and removed from the IP, add the onions and garlic to the IP and sauté until softened, about 5 minutes. Stir in the bay leaves, wine and broth, scraping the bottom and sides to deglaze. Add the browned meat back into the pot along with any juices from the plate. Stir in the balsamic vinegar, frozen peas and carrots; allowing them to warm through then serve.